Thanks for checking out the Kingdom Minded Show. The best way to listen here is to open another window from the red bar on the bottom of the page and then you can browse without interrupting the music. We had a fun time putting this episode together for you and I think it will show. There's new music from Tha GIM and Bizzle. We also shine the spotlight on DJ Suicide to show how a DJ gives God glory on the ones and twos. If you are a DJ and would like to submit a recording of you going off for God, you can e-mail an MP3 or link to KingdomMindedRadio@Gmail.com. Please try to make it no longer than 15 minutes. We give a special shout out to my son, Brandon Jackson, who turned 19 today. May God mold you into the man of God you are called to be. There are several concerts coming up. Here's the info about them. Back to School Rally featuring Crosswalk the Band, Realign and Brotha Mike. You can download the show here! Call or text your requests for next weeks show to 775-375-KMRS. Instrumentals by Infantry Beats, J. Griff, Xperiment Beats, Wit, JustWORD, Redd Lettaz and Wes Pendleton. Thank you for listening and we hope something was stirred up in you to be more Kingdom Minded. This post is coming a little late this week. The devil thinks he's slick messing with the technological issues. We got a slammin' show this week. You'll hear new music by Big Fil, Braille, and Identity. We've got the "Phat Freestyle of the Week" featuring local artist Lil Switcha of Identity. We're working on an interview with Godchaserz founder and CEO Brinson. You can look for one coming in the next couple weeks. Here on this 40th week of being on the air in Peoria, we are beginning a new chapter in radio ministry and we are super excited about it. 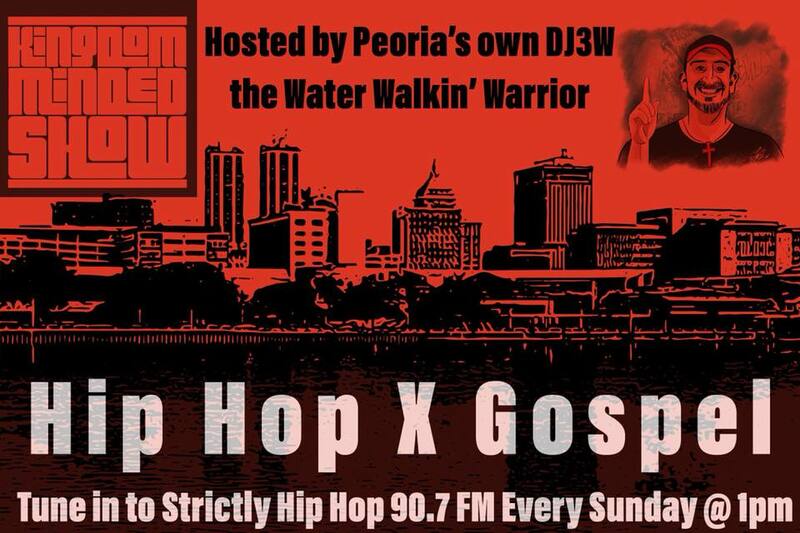 Ghetto Gospel Radio has picked us up for a 2-hour time slot right before Minister eDDie Velez aka Da Preachin' Puerto Rican on the Holy Hip Hop Show. You can listen to the show there by going to www.GhettoGospelRadio.com Saturday nights from 7 - 9 pm EST (6-8 CST) from now on. Join us there while you're hangin' out with friends or driving in your car. That's right, I said in your car. You can listen to the show on Smartphones, iPads, Tablets or your computer at www.GhettoGospelRadio.com Saturday nights. Text or call in your requests for next week's show at 775-375-KMRS. Feel free to leave us a shout out. You can contact us through Twitter @KingdomMindedRS or e-mail us at KingdomMindedRadio@Gmail.com. You can download this weeks show here until we get it on iTunes as a podcast. Here's this week's playlist. Enjoy and be encouraged! Instrumentals between sets by JustWORD, eshon "bombay" burgundy, Infantry Beats, J. Griff, K Beatz, Xperiment Beats, Gift Instrumentals. This has been a great show this week. We have an interview with Slingshot Movement frontrunner, Yaves Ellis. He was very transparent in talking with us. We briefly talked about the significance of 9/11. We played new music by PRo, Identity, Sean Simmonds, Da Truth, and D-MAUB. In fact, I gotta say that the whole second hour is just packed after the interview in the first hour. God is good! We hope you enjoy and appreciate this weeks show as much as we had fun producing it. If you would like to request a song for next weeks show, you can text us or leave a message for us at 775-375-KMRS. If you are an artist and have music to submit, you can e-mail us at KingdomMindedRadio@Gmail.com. Follow us on Twitter @KingdomMindedRS. Like us on Facebook as well under the name Kingdom Minded Show. Here is this weeks playlist! Yaves Ellis Interview including the songs "In Summer's Ear" and "Boxxed In". You can follow Yaves on Twitter @YavesEllis. His website is www.SlingshotMovement.com. The "In Summer's Ear" Album is available FREE at his website, www.Rapzilla.com, www.TraxOnDeck.com, our website here, and more. Instrumentals between songs are by JustWORD, eshon "bombay" burgundy, J. Griff, K-Beatz, Experiment, Wit, Tony Stone and Infantry Beats. We hope something was stirred up in you to be Kingdom Minded today! Good afternoon Kingdom People! Thanks for taking the time to visit our website. We had a blast last week with Identity, DJ Ezra, D-M.A.U.B., K-Drama and DJ KlassyK at the inDependency Tour's Peoria stop. A big thank you goes to Bishop Leroy Davis of Word of Faith Christian Center for opening the doors to this event at the last minute. We thank God for providing everything we needed to make this event a success. He was truly glorified as this event changed from a Kingdom Minded event to a Kingdom event! We also want to thank all the sponsors that helped make it possible, as well as those that helped with some of the logistics. I'll name some of the churches the helped and leave the individuals anonymous. Thank you to Judah International Ministries (my church), City of Refuge (Mr. Rob's church), Word of Faith Christian Center, First United Methodist Church, Rock Church. Thank you to EB Event management for the assistance provided. Most of all, I thank my wife for being there every step of the way with me personally. We pray a special blessing over all of you. We'll give a detailed report of the event and post some videos and pictures as soon as we get them compiled and ready to present. Now to get to this weeks show. We've got new music by Da Truth, K-Drama, Identity, Yaves the Street Pastor, Tha GIM, and Da Messenger. We break down some of the concert that took place last week and have tried to give you a diversified variety of Christian hip hop and contemporary Gospel. We really want your feed back on the show. Leave a comment or call us at 775-375-KMRS if you have any suggestions or shout outs for us. You can also text us music requests. If you have an event you'd like us to provide the music for, contact us and we'd be glad to see if we can help. It's our desire to see the Gospel spread everywhere the ear will hear. You can e-mail us at KingdomMindedRadio@Gmail.com. The instrumentals you heard in between songs were by Wit of Wit and Dre Murray, eshon "bombay" burgundy, Teddy P, Infantry Beats, J. Griff, and K-Beatz.